We have developed a technique called interactive intent modeling that allows humans to direct exploratory search. The technique has been implemented in a real-world search engine SciNet. The search engine anticipates user's search intents and visualizes them on a novel "Intent Radar" screen. Check out our papers in CACM and at IUI'15, CIKM'13, and IUI'13 (best paper award). Our current interaction with information retrieval systems rely on explicit interaction. Could we mine the relevance or interest of the user directly from the human mind? Our research shows, for the first time, that this is indeed possible with the help of EEG interpreted with machine learning. Check out our Sci. Rep. article, and SIGIR'14 and SIGIR'15 workshop papers. 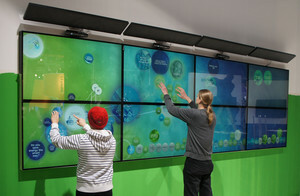 We have created a five-meter-wide MultiTouch wall with Kinect 3D motion sensing camera. The reseachers have solved the problem how to attract people to use the multitouch display wall. The multitouch wall with 3D motion sensing cameras reacts to new potential users passing by and lures them to touch the wall and explore the content when they approach it. Check out our papers at TEI'14 and ITS'13. Results of the focus area research on user modeling in exploratory search will be published in four papers at IUI'16 in March 2016. Our papers are titled: "Interactive intent modeling from multiple feedback domains", "Beyond Relevance: Adapting Exploration/Exploitation in Information Retrieval", "RelaWorld: Neuroadaptive and Immersive Virtual Reality Meditation System", and "Dealing with Concept Drift in Exploratory Search: An Interactive Bayesian Approach". Our article "Interactive intent modeling: information discovery beyond search" was published in the Communications of the ACM, Volume 58, Issue 1 for January 2015. Augmented search, research, and knowledge work are the main themes of the HIIT-wide research initiative that is a strategic research focus of HIIT. It is a big multidisciplinary project spanning several research groups of Helsinki Institute for Information Technology HIIT at Aalto University and University of Helsinki. Several research groups ranging from Human-Computer Interaction to Machine Learning and Complex Systems Computation collaborate to produce cutting edge research and demonstrations that go beyond individual research papers. The main themes of the project are augmented search, research, and knowledge work. The project investigates how Human-Computer Interaction and Probabilistic Machine Learning can be combined to a loop that will increase, by order of magnitude, the effectiveness of search and knowledge work. We are applying our research to scientific data and work environments as well as industrial settings. The methods and tools will be able to better utilize the massive explosion of raw data, documents, distributed information and link structures between these, and sensory information recorded from the users. The methods and pilot applications are expected to revolutionize our work practices in data-driven fields such as modern biology, business intelligence, and others. In particular improving the general problem solving method of science, research, and development, in collaboration with the other fields, is the best way for our research community to contribute to solving the grand challenges of humanity. How to join the Focus Area? Contact Tuukka.Ruotsalo(a)aalto.fi or Giulio.Jacucci(a)helsinki.fi to get started. HIIT-Wide Focus Area research has been extended to a large national project Revolution of Knowledge Work. It is funded by Tekes, as a large strategic opening. The project creates information-seeking and sense-making methods supporting a revolution of knowledge work by combining the potential of human creativity and the capability of computers to handle data. MindSee aims to develop an information seeking application that exemplifies the fruitful symbiosis of modern Brain Computer Interface technology with real-world Human Computer Interaction. The result will be a cutting-edge information retrieval system that outperforms state-of-the-art tools by more than doubling the performance of information seeking in realistic tasks.